Search for deals and coupons from Pottery Barn Kids and over 100,000 other retail stores, gas stations & restaurants inside The Coupons App. Explore exclusive shopping and restaurant offers at thousands of nationwide and local chains. Browse our best coupons, free samples, view local deals or see popular retail stores. 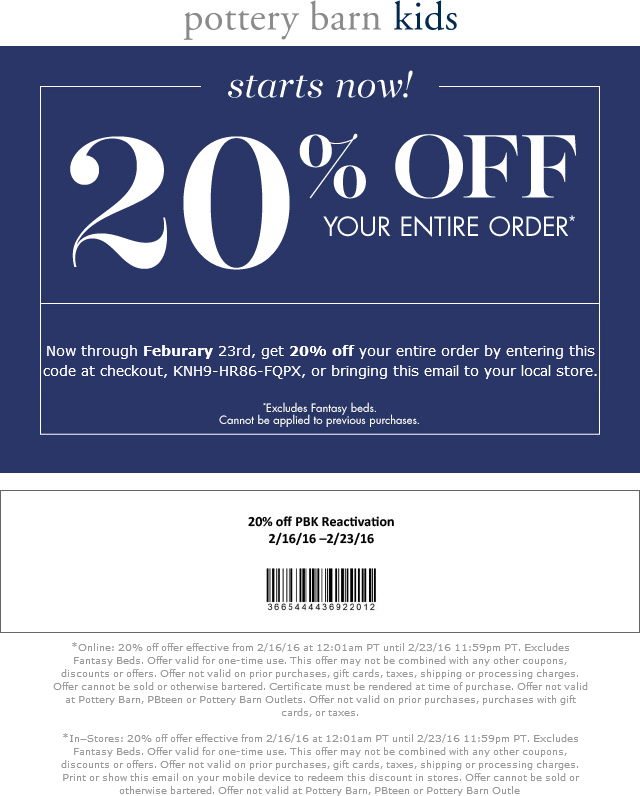 Get alerts when we offer hot new savings at Pottery Barn Kids and all your favorite restaurants & stores. Get automatic notifications when Pottery Barn Kids deals are nearby. Save coupons for viewing anytime, anywhere. Get calendar reminders when your saved Pottery Barn Kids coupons are about to expire. Win fantastic giveaways from our weekly contests!